I am trying to find some customer facing material I can share on how to set up and administer their accounts with the new MyService360 portal. In addition, it seems that DSM's have lost the ability to execute some basic functions, like administer sites and view contacts, so a solution to that would also be appreciated. One change that does not seem to be a step forward is that in order to create a customer group, it needs to be built from individual site ID's rather than from a search on the customer name. Otherwise, it looks and feels good - just a bit quirky in places. I understand that our Customer Service team has reached out to you directly to discuss the issues you have been experiencing. Please do let us know if we can be of further assistance. We appreciate your feedback and thank you for your continued patience. yes i am now able to get to my tickets. Who's bright idea it was to set default filter in MySupport360 to "TLA Flag" and "Install Base Status" ? Unless i clear those filters i can't see my tickets. How do i make it stick, right now i have to clear these filters every time i go to MySupport360. I also don't care about the map, i need to be able to persist my view to "Grid". How do i do that ? Honestly all this pretty "fluff" is getting in the way of main purpose of the tool, that is to interact with support organization. Analytics and reporting should be moved out of the way, it feels like you are forcing it down our throats right now and we have to find work around just to get our tasks done. Ditto, Dynamox! Cannot stand the new format and finding my tickets are a pain. Then again, maybe I am old school and I dislike changes like this. Hi Sergey Kamenetskiy, Brian Coulombe your feedback is being considered and is highly appreciated. Rest assured that your satisfaction is our priority. I am receiving insufficient privileges when attempting to open the company information link on the service center page. before this release I had 20+ sites that I am the account SE for and now none are showing up. can you assist with these issues? We appreciate the feedback. You can find instructions for company administration, custom groupings and general set up on the Online Support Help Page. I am trying to follow particular SR ( not created by myself ) but cannot find ``chose SR to show `` function. As we( as a team ) need to follow couple of SR even created by someone else , please advise how to follow SR .
Aya, is this your own teams SR? Do you have the SR number? What I have found works for me (and I really hope EMC gets the bugs out of this site fixed ASAP as it's very problematic from a Storage Architect's perspective) is to open your OWN SR and at the end of the web address for YOUR SR, paste in the SR number you're looking for. If you cannot view it, either add your site ID to your list of sites or open a new SR to EMC. I've found occasionally that even though some of the various storage devices are on my site ID, even sometimes I cannot view them. We do apologize for any inconvenience some of the recent changes may have caused. The team is working diligently to address all customer concerns and technical issues. If you're experiencing any bugs, please report them at support.emc.com/feedback. With the transition to our new Service Request platform, the ability to watch and/or receive notifications on a particular SR, for which you are not the primary contact, is temporarily unavailable. It will be coming in a future release. 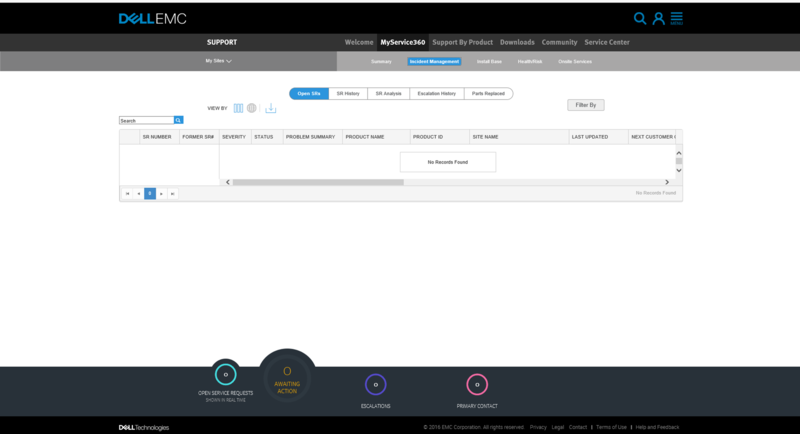 That said, you can set up a new SR Event Notification for a specific site, custom Site Group, or Product Group from the Preferences link found below the navigation menu from any EMC Online Support page. This will enable you to receive SR notifications for any SRs against a site or product, or grouping multiple sites or products of your choice. Please refer to the help page for step by step instructions.